Stan is the slick and impressive streaming media service Australia has been waiting for – though we do look forward to more content, particularly in its movie library. UPDATE: We've expanded the compatible devices section of our Stan review. Read on to find out more. Now that Australians have spent some time with Stan, it's time to reflect on how well the final product has delivered in terms of its primary goal – to give Aussies the streaming video-on-demand experience that they've been clamouring for. Since Stan's Australia Day launch, Aussies have become familiar with what instant streaming content is all about, but is that content up to snuff? And how does Stan perform now that it's out in the open and away from its preview phase? Then comes the big question: does Stan have what it takes to keep Australians coming back for more given the popular of Netflix and its ever growing lineup of 4K original content? Getting Stan up and running is a fairly straightforward process, though you will require a few things in order to view the service on your television at home. First of all, you'll need to decide which service you want to subscribe to. 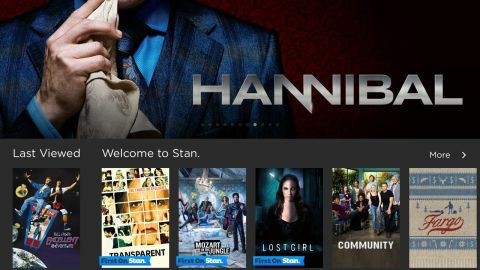 Stan offers three options: Until now, subscribers have access to the $10 a month Stan Standard service, which offers Full HD streaming and downloading functionality to three devices simultaneously. This price has now been raised to $12 a month, which a new single stream, standard definition plan taking the $10 entry-level price point. Now, Stan has a new Stan Premium service, which will give you access to 4K Ultra HD content on four screens simultaneously and the ability to download on five devices for $15 a month. If you're an existing customer who wants to upgrade your account, simply go to your app's settings, click on 'Plan', pick your desired option then hit 'Save'. At present, Stan's 4K content can only be viewed on selected 4K compatible Sony, Samsung and LG smart TVs, as well as the PlayStation 4 Pro and Xbox One X. At launch, a compatible iOS or Android smartphone or tablet was needed in order to browse Stan's content library, in addition to an Apple TV or Chromecast media streaming device so that you could AirPlay or Cast the content over to your television. Thankfully, the Stan app has made its way to the Apple TV, PS3 and PS4, allowing users to browse the streaming service's content library on their TV screens. And, though Stan was previously absent from Xbox consoles, the app is now available on Xbox One with platform-exclusive features, such as the ability to browse and control the service with Kinect's voice recognition functionality (if you happen to have a launch console – the newer models have removed the Kinect functionality entirely). It should be noted that while Stan is available on the Microsoft's current console, the app is still unavailable for last generation's Xbox 360. On top of the platforms listed above, Stan's list of supported devices continues to grow, as it's now also available on a number of 2012-2016 model Samsung smart TVs, 2014-2016 model LG smart TVs and now 2014, 2015 and selected 2016 model Sony smart TVs that are running the Android TV platform. Stan has also expanded its compatible devices list to include support for selected 2015 and 2016 model Hisense smart TVs, and is also available on every Hisense TV released in 2017 and going forward. Alternatively, you can use your PC or Mac to view Stan's content on most browsers and stream it to your Chromecast from there. Stan has also released a native version of its app for PCs, tablets or smartphones running the Windows 10 platform. This version lets you use to Cortana voice-assistant to select the shows and movies you want to watch, and even lets you pin shows to your Start Menu. Stan is compatible with iPads running iOS7 and above from the second generation onwards, as well as all iPad minis and iPhones from the fourth generation onwards. Most Android phones from 4.2 onwards are supported, including recently added support for Sony's Xperia Z1, Z2, Z3 phones and tablets, HTC One M7, M8, M9 and Desire and LG's G2, LG Optimus L7II smartphones. In terms of tablets, most Android units running 4.2 and above will work, aside from the HP 8 G2. Once you've selected something to watch, you can start playing it on your phone or tablet, or tap the AirPlay/Cast icon to throw it to your Apple TV or Chromecast, at which point you can put your smart device to sleep. Though the Stan app for Apple TV initially lacked the Siri voice search functionality that Netflix has been enjoying for a while, a new updated has added Siri universal search support. But that's not all – Stan is now available to stream on the Roku 2-powered Telstra TV streaming box. Following on from Netflix, which recently brought offline viewing to its iOS and Android apps, Stan now allows users to pre-download content to their devices to watch while they're outside of a Wi-Fi network. Best of all, almost all of Stan's library is available to download, unlike Netflix which only offers a small selection of its library. This guide tells you exactly how to download your favourite shows within the Stan app. Anyone who's seen Netflix's interface should know what to expect with Stan in terms of functionality. Stan is definitely on the same playing field when it comes to the service's interface. Admittedly, it's kind of awkward that your highlighted content box sits at the right side of the screen. On Netflix, the box sits on the left, giving you a good idea of the next batch of titles come in from the right to make their way into your highlighted section. With Stan, having this box on the right means you have no idea of what's coming up – you only see a trail of titles that you've already passed over on the left of the screen. More importantly, browsing titles like this feels unpleasant, like walking backwards into a crowd. That said, most everything else about Stan's UI is impressive. Movie and TV show publicity art is all over Stan, and it looks incredibly slick – its carousel in particular is clean and image-driven, with over half of our iPad's screen displaying some of Stan's most exciting content, like its exclusive shows Transparent and Mozart in the Jungle, as well as other premium dramas like Hannibal and Fargo. Flicking up on the screen will show you a range of genres and collections below, such as Comedy Classics, Best of Australia and World Movies, with titles and poster art laid out horizontally for you to swipe across and browse. Tapping on a show will let you choose the season and episode you want, while tapping on a movie will give you some information screen where you can press play and jump straight in. Options can be revealed on the left side of the screen by tapping the icon in the upper left hand corner, allowing you to switch profiles, browse TV and movie genres, kids content, your watch history or your list of saved shows (just like on Netflix), and the upper right hand contains a search bar and access to your profile (again, just like on Netflix). Stan's Apple TV app is slightly different to the tablet and smartphone version, in that it lists its sections along the top of the screen, with genres and content laid out in a style that's more consistent with Apple TV's other apps. Unlike its competitors, Stan gives you the option to choose the image quality of your stream on smartphones and tablets via a cog icon at the bottom of your player window. You can opt to use Stan's automatic setting for an adaptive bit rate that's tailored to the quality of your connection, or choose the SD or HD constant bit rate encode, depending on whether or not you have bandwidth to spare. Though curiously missing at launch, Stan now offers closed captions on a selection of its shows, meaning that hearing impaired people can enjoy at least some of its content – we hope that Stan eventually applies closed captions to its entire catalogue, just like Netflix has been doing for years. Stan doesn't have the ability to recommend movies and shows to you based on your movie habits, which is one of Netflix's best features. And, because there's no rating system implemented, there's no feeling that any of its 'trending' shows are actually driven by viewership. Hopefully, a personalised 'recommended shows' feature is somewhere in Stan's future.